Navigon is a bad company! I own a Navigon device for navigation in my car, it was the top of the line device and it works quite well. However connectivity with my Apple computer broke when upgrading to an upgrade of the operating system. After installation of Mountain Lion the Navigon Fresh application cannot connect anymore with the server hence failing to work, the error raised is CG2009. Navigon acknowledged the problem but has made little efforts to fix the problem since 2011, yes you read that well, 2011. That is almost 2 years now, I run Mountain Lion for about 1.5 years! A beta was released of the Fresh application but it did not fix the problem. What I read in the forums is that the beta does not work for anyone. 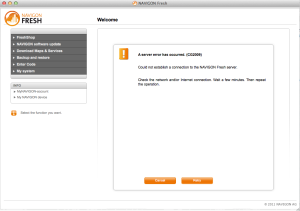 It is highly disappointing and proves that Navigon does not take their Apple customers seriously. Moreover I wonder if Navigon actually takes their customers serious at all, while every other Navigation device received updates every now and then, there has not been no new firmware update since I bought the device. Occasionally the device wants to send you of the highway and then immediately back on the highway, at every exit, that is clearly a major bug, yet it is not being fixed. Furthermore there is lots of room for improvement for the user interface, which could also be addressed in firmware updates. So no wonder that people use their iPhone etc to navigate to a destination. I just feel that Navigon is a bad company and that they don’t have a right to exists if this is the way customers are treated. Tagged: car, cg2009, gps, navigation, navigon.